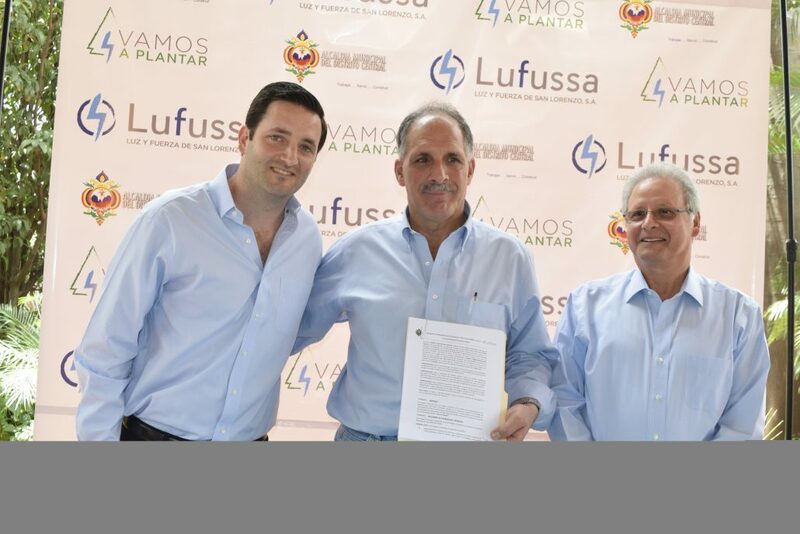 The Lufussa Company founded by the brothers Schucry, Luis and Eduardo Kafie, signed a collaboration agreement with the Mayor’s Office of the Central District (AMDC) with the objective of delivering a new municipal nursery in El Picacho Park, escorted by the tools and Inputs to produce approximately 112,000 trees over the course of the year. These trees will be used in the reforestation activities of the Municipality of the Central District, always within the framework of the “Let’s Plant” initiative that Lufussa has been leading since the previous year. In May 2016, following the severe damage of the pine bark beetle in the national territory, Lufussa pioneered and signed the collaboration agreement “Let’s plant” with the Institute of Forest Conservation (ICF), whose sole objective is to contribute to restore the areas affected by this terrible pest, aiming to contribute one million trees at the national level. The scope of this new agreement, now with the CDMA, establishes that Lufussa would provide a new nursery to the CDM, to be located in the United Nations Park of El Picacho, in addition to delivering the tools for use in the care of the Trees, as well as all the necessary inputs for the production of 112,000 trees in that nursery during the course of 2017. Lufussa will also support, through its volunteer programs, in the filling of the bags and in reforestation activities of green areas from the city. Meanwhile, the CDMA is committed to use the inputs, tools and facilities supplied by Lufussa, as well as provide proper management and maintenance to the nursery through the allocation of personnel and resources, and finally to the planting of trees In the green areas of the city and its water supply basins. Mayor Tito Asfura, in his speech said that “we are happy because the Lufussa Company is helping the city to improve the environment. The support of this company will help us to improve the theme of our nurseries and all that is the reforestation of our beloved city of Tegucigalpa”. http://lufussa.com/wp-content/uploads/2017/03/firma-de-convenio-vamos-a-plantar.jpg 1365 2048 @lufussa http://lufussa.com/wp-content/uploads/2017/12/logo-correcto-de-lufussa-845x684-copia.png @lufussa2017-03-23 15:20:192017-03-23 15:20:19Lufussa and the Mayor of the Central District sign the agreement "Let's plant"